Este fim de semana o Zé Batalim convidou-nos para uma sessão de wake na barragem da Agueira, um bom exercício para os períodos de falta de vento. As manobras de kitesurf ao pé das de wakeboard são uma brincadeira de meninas 😉 , aqui o barco puxa a grande velocidade e o cabo está quase paralelo á água. Um bom treino ,mas puxadote ! Os Wind Catchers acompanharam de perto a representação portuguesa na etapa do PKRA, em Portimão, no passado mês de Julho. Aqui fica agora o registo de uma semana cheia de vento e de atletas excepcionais! Danilo Nacarato, Fábio Martins, Gonçalo Gomes, João Fontainhas e Rui Pedro Meira (bem como os outros tugas que por lá andaram…) na sua passagem pelo PKRA 2008, catched by WCTV. 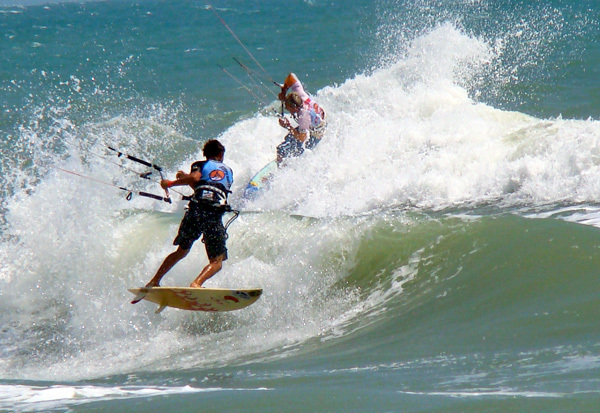 The Superkite Brasil Wave Masters 2008 have been completed today. The show started at 8am with the women competition. First riders in the water: Kirsty Jones and Ainhoa Garcia. Followed by Kristin Boese and Kari Schibevaag. 4 different European countries in the fight ! Ainhoa Garcia, handicapped with a knee injury, did her best but only managed to reach the 4th place. Kristin Boese, 2007 KPWT World Champion, got the third place. Kari Schibevaag from Norway has incredibly improved in this discipline but she left the first place to the British Kirsty Jones, specialist in waves. On the men side, the battle was tight from the start in Pico das Almas. Only one Brazilian rider made his way through the finals: Ian Glaza Owczarzak. In front of him full expertised KPWT competitor: Jesse Richman and Jan Marcos Riveras. In the looser final, Jesse Richman gave his outmost versus Abel Lago, the 2007 KPWT Wave World Champion. The two talented riders performed very well and the kid from Hawa�won the 3rd place overall. 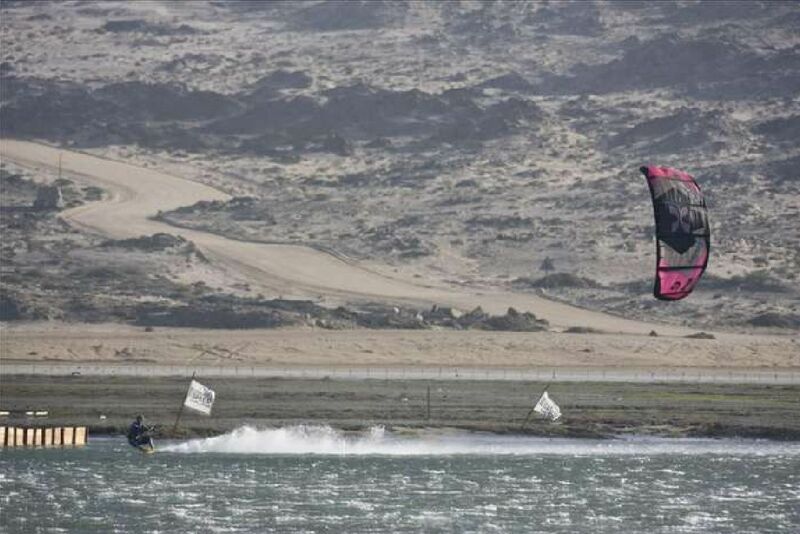 In the Final, two Kitesurfing nations were represented: Dominican Republic and Brasil. Jan Marcos Riveras from Dominican Republic astonished the spectators on the beach. A pure show man! Ian Glaza Owczarzak, from Brazil, also passed amazing moves and imposed his style. After an incredible heat, the victory finally went to the Dominican Republic and Jan Marcos Riveras. The whole caravan came straight back to the Golfinho Hotel for the Course Racing competition. As we are writing this press release, the first course race is running. 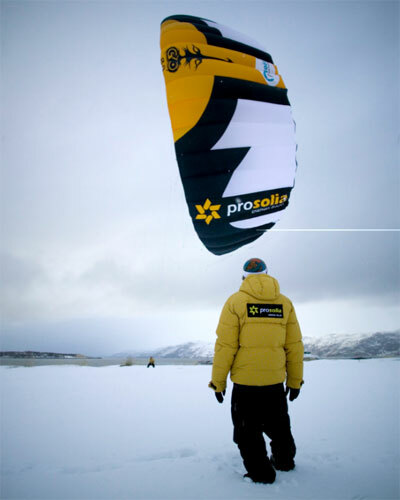 The programme for the week-end is very hectic: Course Racing, Freestyle, Kiteloop and Big Air. No time to rest. Cumbuco is one of the rare spots in the world where you do not have to worry about the wind. The wind is programmed like a ventilator and keeps blowing all day long. Just in – still to be confirmed by WSSRC officials, but we may have a new world record of 50.1 knots, set by Sebastian Cattelan in a brilliant early run. Rob Douglas set a scorching 49.9 knots, then Catman blew past on the very next run with 50.1 knots. Sjoukje Bredenkamp (ZA) has blasted her old record of 42.35 knots with a 45.1 knot run. Results still to be ratified on video records and adjusted for currents by WSSRC officials. Windsurfers now very, very hungry to get out there as ESF event organisers reset the course for high tide conditions. Bjorn Dunkerbeck comments that he is very confident of doing some sizzling runs this afternoon still. Para mais info consulte a página oficial da competição, que decorre actualmente na Namíbia, a Luderitz Speed chalenge. Alguns aventureiros espanhois de Sant Pére Pescador resolveram atravessar o Artico. Jose Chiado e Xavi Carrasco da escola Ventilador fizeram parte desta aventura! Veja as fotos e o diário da aventura na página da expedição ! A Escola Superior de Desporto de Rio Maior, no âmbito do Programa de Formação Continua, vai organizar um curso de nos dias 19, 20 e 21 de Setembro. 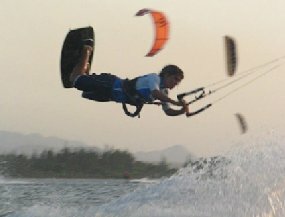 O curso prático de Kitesurf está destinado a todos os interessados na prática de Kitesurf, professores de Educação Física e Desporto Escolar, do Curso Tecnológico de Desporto e Técnicos de Desporto. O curso decorrerá na sexta-feira, das 17 às 21h e no sábado e domingo, das 9 às 13 e das 14 às 18h, em Rio Maior, Foz do Arelho e Peniche. O formador e director do curso é o professor da Escola Superior de Desporto de Rio Maior Henrique Frazão, Mestre em Desporto de Recreação e do Lazer.